My son was very happy with this jewelry box. Perfect for his growing watch collection and cuff links, as well as chains. Attractive, well packaged, arrived intact. 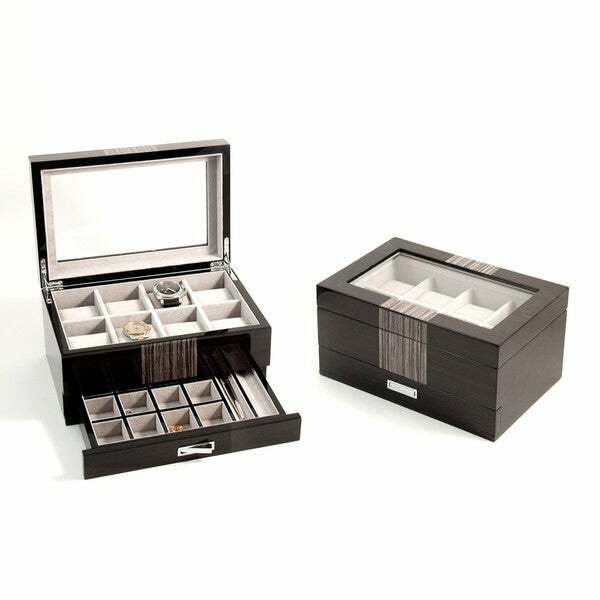 This elegant lacquered wood box featuees velour lined compartments for your watches and accessories. The grey finish completes the look. This box has been great for my watch collection, cuff links, and tie bars. It is sturdy and looks high-end. Roomy enough for everything I need to put inside but not too large that it would take up too much room on the counter. Got this for my husband's birthday and he absolutely loves it! He said it's just what he needed for his watch collection and cuff links. It's great quality and really nice glass top so you can see your collection through the top. The price is ridiculously good for the quality of the box! This watch box is well made and has plenty of space to store more than just watches. The stylish design was also a hit! Purchased it as a gift for my son and he loves it. "The drawer has how many squares?" "Hi, what color is the product exactly? On the screen it seems dark brown or black with grey elements, your description says it is grey. Please clarify. Thanks!" Hello Anna, the color does appear to be more of a dark brown with accents of grey in my opinion. Please let us know if you have additional questions. Thanks for shopping with us. Appears to be a snazzy product just right for my snazzy husband. Has all the features I am looking for at a reasonable price. I hope it is the right color. I can't tell by the photo. Will see when I receive the box. Thanks. Men's and women's watches with automatic winding technology are stylish, interesting, and low-maintenance. These Frequently Asked Questions will help you to choose an automatic watch that fits your lifestyle. You can use wristwatch case measurements to choose new watchbands or find a men's or women's watch with the right-sized dial for your look and style. Follow these steps to quickly and accurately measure a watch case. Some watches contain intricate manual movements, while others use tiny vibrating crystals to stay on time. Read on to explore the fascinating world of horology and learn more about various available watch movements. So you want a waterproof watch you can wear while you're washing dishes or swimming? You'll find a wide selection of water-resistant watches to wear for work, play, and formal occasions. FAQs about Kinetic Watches from Overstock.com. These low-maintenance timepieces don't require any power source other than the energy they receive through your own daily movements. Chronograph watch glossary from Overstock.com. This glossary defines the common chronograph features and many extra features that are found on the best chronograph watches.